Yesterday I went to the hair salon to have my hair highlighted and cut. Someone had decorated the salon for Christmas already. Everywhere. Some of the decorations I recognized– like a fake pine garland with bulbs and bows draped over the top of the mirrors. I recognized the canned Christmas songs playing endlessly. But I couldn’t figure out what the large objects suspended from the ceiling were– nor why they were hanging over each stylist’s work counter. In their way. After paying for my highlight and cut, I gave J a big tip. 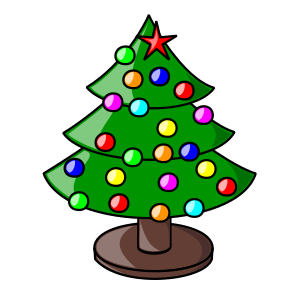 She’s going to need all the help she can get to make it through a holiday season with an upside down rotating Christmas tree dominating her work space– and confused, outspoken customers commenting on her boss’s stupidity cleverness. Our mailbox is a rectangular, black metal one that sits on top of a white wooden post by the street. It was tomato-ed. This is a first for us. In the past our mailbox has been: smashed with a baseball bat; peanutbutter-ed; egged; toilet paper-ed; and robbed. [One summer I decided to put a small bracket on the back of the white post and hang a basket of geraniums from it. Very pretty… for the few days that it was there before someone stole it.] But we’ve never had a tomato thrown at it. The attack of this not-so-rotten tomato occurred between 6:30 a.m. and 8:00 a.m. while I drove Z-D to work. Our mailbox, which is large, shiny and very noticeable when pulling out of our driveway, was just fine when we left home. But when I got back home, the door to it was hanging open and there was a small dent in the side of it. This I saw from the driveway as I pulled in. It wasn’t until I walked down our driveway to see up-close what had happened that I realized that we had been tomato-ed with a large, firm, red tomato that left its seedy drool all over one side of our mailbox– and its gushy guts in the grass around the bottom of the wooden post. As I didn’t grow up in suburbia I can only guess at the motivations for tomato-ing someone’s mailbox. Questions plague me. Which came first: the tomato or the mailbox? Was this planned? 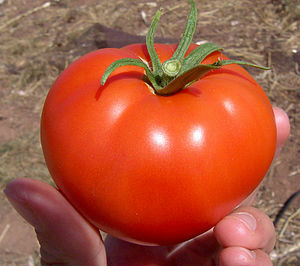 And if so, where did the perp get his or her tomato? Stolen from someone’s garden? Purloined from Mom’s frig? Purchased at Kroger? Is it possible that our mailbox wasn’t the intended target? Considering there are high school kids in the two house across the street from us & in one house next door to us, I have to wonder if this is a case of mistaken tomato-ing. Answers to these questions elude me, leaving me to suspect that the real reason our mailbox was tomato-ed has nothing to do with logic. I imagine, that like many things in life, the real reason that our mailbox was tomato-ed is that it was in the right place at the wrong time. I’d tell you in my own words, but this infinitely better than anything I could ever write. It’s funny. Enjoy! For smirks and giggles I started a Twitter account last week. And to date, I am underwhelmed. I can see that if you have family and friends who are on Twitter, you could have a fun time staying in touch and sharing info that is of interest to your group. I don’t have any family and friends on Twitter that I know of. I can see that if you were a fan of some celebrity, then it might be fun to see what this person had to say. I am not a big enough fan of any celebrity to care about their day-to-day thoughts and actions. I can see that if you had a smart phone and were in a boring real-life situation– at the doc’s office– on the bus riding home from work– waiting at the airport– visiting a crazy old relative whose politics were the opposite of yours– it could be a blessing to have to check your Twitter account. But my phone isn’t smart, so I don’t have that option. I can see that if you had no access to the internet via a desk or laptop computer, then a Twitter account could give you a fast RSS-style service that would keep you up-to-date on your favorite topics, websites, mags, and newspapers. But I am very fortunate and have both a desk and a laptop computer with internet connection that are available to me at any time. So, what am I missing about Twitter? Is there something there to hook my interest so that I might begin to smirk and giggle as I had hoped that I would? Or is it as pointless as it seems to me? Then I did some research and found this information. Now I am left really wondering. So I’ll ask you, gentle readers? Do you twitter and tweet? And if so, what do you get from the experience? Explain Twitter to me. Please. I went to the mall to look for some spring clothes for me. I parked in the only place I could find– a parking garage about halfway between two department store anchors on either end of the mall. Then I walked to the end of the mall to shop in the big bad department. Once inside I went to the exact spot in the exact department where I had seen, in January, what I wanted to buy. But my item was not there. In fact, the whole large area formerly devoted to this particular brand was gone. So I went in search of a sales associate. Eventually I found a woman and asked her where the brand I wanted was hiding. I know department stores. They hide things. She told me that they no longer carried that brand. So I asked: “why?” And this is what she told me. The brand that I was interested in buying is also sold on a tv shopping network. Dishonest shoppers, who had purchased discounted items on the tv shopping network, were returning these discounted items to the big bad department store– where the big bad department store was giving them a full price refund— which was costing the big bad department store money. So I thanked the sales associate for letting me know what was going on and left the big bad department store empty-handed. Again. As I was walking back to my car, I started thinking about what had just happened. I had made the effort to buy something, but was defeated by the very store that had convinced me that I needed this item. That was annoying. I’d been told a story that made the big bad department store look like a victim– which, I guess, the sales associate thought would make me sympathetic to the plight of the store. That was weird. But most importantly, I’d had the belated realization that I should never, ever listen to what the big bad department store says. Everything about the place is hinky. And this insight, gentle readers, was worth the trip to the mall. I have learned. I am better for it. And you know what? I’m not going back there again.